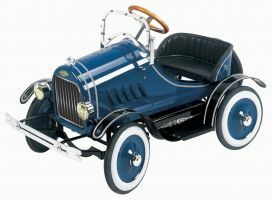 This shiny blue Roadster Pedal Car is made with an all-steel body, which means that it will stand up to years of active play, and its rubber tires make for a smooth, comfortable ride. The padded seat and adjustable pedals mean it'll be a cushy ride for any kid! The steering wheel really turns to guide the car and young driver on their journey. It's painted with a lead-free, blue metallic glossy powder coat finish, and has been tested and approved for safety.